Tiny metal 3" lever mounted on a black plastic base. Mechanism covered by 1"x1"x1-3/4" grey metal cover. All mounted on a grey stamped steel base. These keys were used with R-143, R-159, Angara and some spy radios and some special radios. The key is also supplied in a small green case. This scarce version of the TFK key is mounted in a steel case with hinged lid and lockable latch painted in olive green. It carries a label on the lid with its serial number 1122341169. Under the serial number is УВУ = Russian=Устройство Выносного Управления = Remote Control Device. On the underside of the key is an opening giving access to the switch terminals for wiring purposes. Also inside, apart from the switch, are the filter elements. Obtained from Andy UT2WQ in October 2018 and who supplied the Russian translations. Andy also states that he has only ever seen two of these keys, one being this one, the other is in his collection. Light metal 4-1/2" lever mounted on a black plastic base. Mechanism covered by black metal swing over cover. All mounted on a black stamped steel base. This key was first produced before WW-2 in 1938. This inexpensive training key has black painted stamped metal parts with doorknob style knob integrated onto a narrow black plastic base. Many of these keys were made for use in training DOSAAF (MARS) and school children in the use of the code. Greg Ulsamer reports that DOSAAF represents abbreviations of the Russian words: Dobrovol'noye Obshchestvo Sodeystviya Armii Aviacii i Flota which means in German: Freiwillige Gesellschaft zur Forderung von Heer, Luftwaffe, und Marine. In English, it is: Voluntary Organization for the promotion of Army, Air Force and Navy, a pre-military organization to train children in these fields. They are found in various colours and although appear quite cheaply manufactured, actually are quite a nice key with a positive feel. A well made Russian Mini Key with original cord and plug but missing the sheet steel / aluminium cover that would have enclosed and protected the contacts. It has conductor strips on the top side of the base very similar to the Marconi "Roadmap Spark Key from circ 1912. My research finds that this Key was used with the R104M Radio and dates from circ 1950 but would welcome input from one of our Russian Key collectors. This is identical to the above key which is missing the original cord and plug but does have the cover that is missing from the other example. 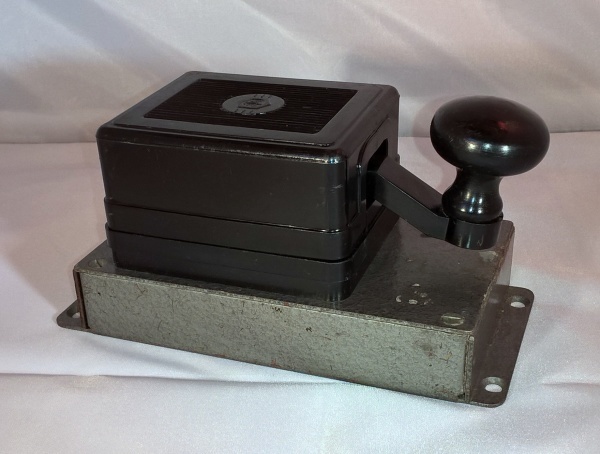 This large heavy duty key has a 5-1/2" lever mounted on a black plastic base. Mechanism is enclosed in a grey painted aluminium cover measuring 2"Wx3"Hx4"D. It was used with the high powered 1kw R-102M radio sets. 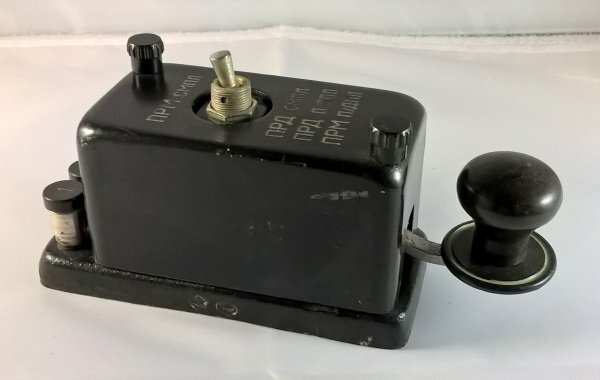 Earlier versions of this key were used with airbourne SB-5/R-801/R-807/Danube/RSB-70 which are the Russian replicas of SCR-274, ART-13, and ATC/ATD) radio sets. This key is complete with its original lead and plug and was purchased from Andrzej SQ5OBO in Poland in 2018/19. 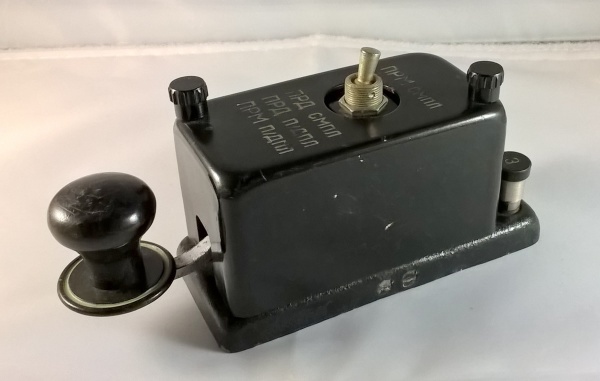 This large heavy duty key was used as part of the PARKS-0,08 Radio Station. It looks similar to the more common key used on the R-102M. Radio Station but this key predates it. Under the cover are a number of capacitors, some which are dated 1956 so it is taken that this key was being produced and used at that period. The PARKS-0,08 Transmitter operated on MW:250-600 KHz in 4 bands, SW:2.5-12 MHz in 4 bands, 40 Watts microphone and 80 Watts CW. 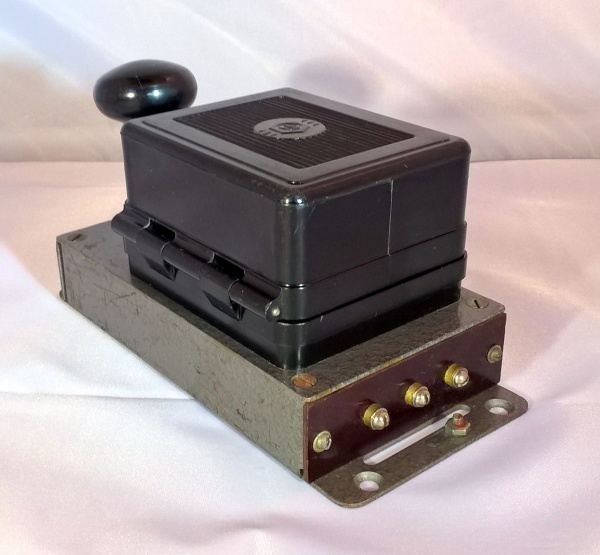 Mechanism is enclosed in a black painted aluminium cover measuring 2"Wx3"Hx4"D. This has a 4 switch assembly built into the cover along with a socket on the side of the base and a heavy duty braided lead and plug. I have tried to translate the switch positions with the top left switch the most uncertain due to the faded labels but they have now been confirmed as follows; Top left reads Control On and Off, top right reads TX Power of 50% and 100%, bottom left reads Transmitter On and Off and the bottom right reads TX and RX. The use of the side socket is still unclear. The above information is a correction to the original description after in depth contact with Vadim Balandin UA9MCM in Russia and with who I am extremely grateful for his invaluable input in correcting both this key and others in the collection. This is the front panel of a Proton R-353 spy radio set which has the manual key and the semi automatic numerical dial along with the flexible work light which is missing the head. The R-353 is a valve-based spy radio set, developed in the late 1960s in the Soviet Union (USSR), and built at the Proton factory in Kharkov in Ukraine. The radio features a built-in tape-based burst transmitter that reduces the risk of interception and radio direction finding. The transmitter produces an output power of 50W, which is sufficient for an operational range of 500 to 3000 km. This rare radio is also known by its codename PROTON. Like most Russian equipment of the era, the case was finished with Hammerite paint. Two colours are known to have been used for this: grey (most common) and green/blue Hammerite. The purpose of the different colours is unknown, but might be related to the end-user or the factory. In practice the colours were often mixed, so that a grey transceiver might contain green parts. There were three available modes of transmission, manual, semi automatic or automatic burst. 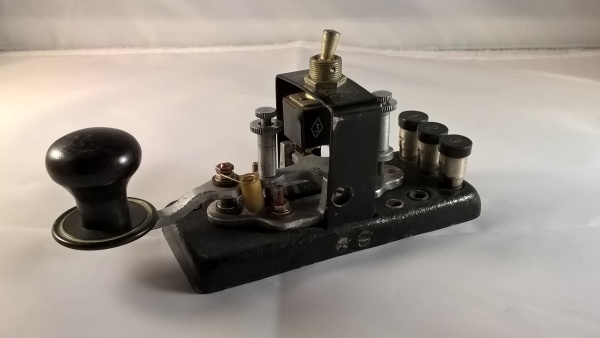 In case of an emergency it was possible to use the R-353 for manual transmission of messages in Morse code, by using the built-in Morse key. 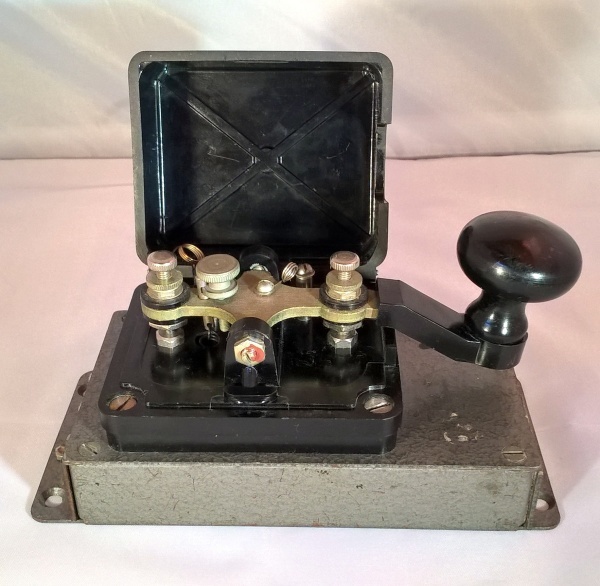 This allowed any kind of message to be sent, even plain text, but required the operator to be very experienced in giving and taking Morse code. 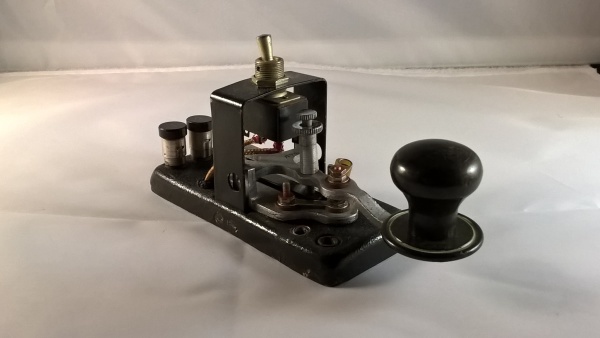 Another way of sending an emergency message is by using the semi-automatic Morse dial. This would be particularly useful if the operator was unable to send messages in Morse code manually at a reasonable speed. Unlike the manual key, the dial is only suitable for numerical data (0-9). The semi automatic dial is located at the centre of the interior of the top lid and is connected in parallel with the manual Morse key. Once the frequencies are set and a radio link with headquarters is established, all the operator needs to do is dial the numbers in the correct order, using the circular dial. This involves pressing down the number and (whilst holding it down) rotate the dial clockwise until it blocks, and the releasing the number. The chosen number will now be sent in Morse code. Although this is a convenient way of sending messages without any knowledge of Morse code, it is still fairly slow compared to a burst transmission and therefore a potential candidate for radio direction finding. The best and certainly the safest way of sending messages were by using the built-in keyer for a fully automatic transmission. This requires the (pre-coded) numerical message to be recorded onto a metal magnetic tape, which is then transmitted at very high speed as a so-called burst. This unit was purchased from Andrzej Gawryś SQ5OBO from Poland in 2018/19, thanks Andrzej. This is a Russian Air Force Key from the Transmitter Set R-807 (RSB-70). The two position switch move between “receive simplex” and “send simplex / send duplex / receive duplex”. It has a removable cover although both spring tension and gap adjustment can be accessed by the two protruding screws. This example differs somewhat from others I have seen in so much that instead of long tension springs being present on these screws there are long locking nuts that are also accessible with the cover in place. There are no markings indicating a model number or a manufacturer but after in depth contact with Vadim Balandin UA9MCM in Russia, I have now been able to give this key a more accurate description. I am extremely grateful to Vadim for his invaluable input in correcting both this key and others in the collection. The release of the radio transmitter R-807 (RSB-70) began in 1947. It was intended for the implementation of radio communications for aircraft of various purposes with ground radio stations. Over time, the radio transmitter began to be installed on river and sea vessels, as well as on ground radio stations for various purposes; since 1953 it served as the basis for an aircraft command radio station operating on a stub antenna. Russian Hand Key Model KMF circ 1965. This is a Russian hand key Model KMF, not to be confused with the Model TK. 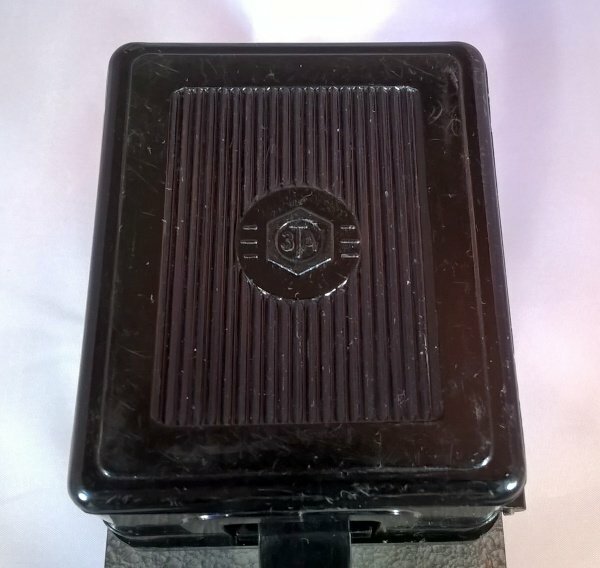 This model was manufactured at the Ukrainian Telegraphy Equipment Plant ZTA in Cherkassy as can be seen by the embossed logo on the lid “3TA”. The other noticeable difference is the spring tensioner, on this model it is similar to those found on British keys with the spring attached to a rod which is lifted by unwinding the screw which is set forward of the rod. On the TK Model the spring is attached to a threaded rod which is adjusted by screwing down the attached nut which then lifts the rod. This key was also manufactured earlier than other research on the TK, inside the base is a set of capacitors acting as anti spark and cleaning filters. In this example the capacitors are dated 1965 which confirms information supplied by Vadim Balandin UA9MCM in Russia which indicates, by way of a photograph, a KM key being operated by a famous Soviet ham radio operator Ernest Krenkel on the vessel “Zubov” dated 1968. All this information indicates that this model key, the Model KMF, was certainly manufactured from 1965 onwards. These keys were used by civilian services as well as by the Soviet military.